The “Proud Woman” mosaic was made using a loose impressionistic eye, which was a stylistic departure from my previous work in mosaic. Up until this mosaic, I was concerned with using concentric lines of tiles to convey motion and flow, similar to that used in classical Greek and Roman mosaic, and that old approach required a large amount of time to cut and place each tile. 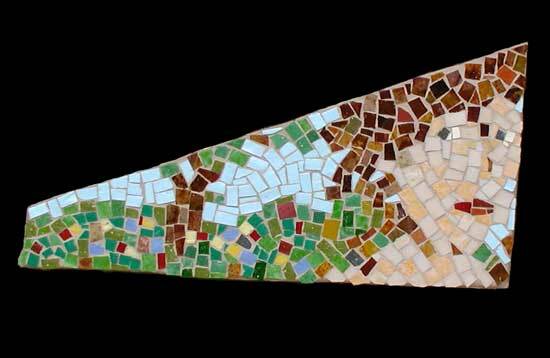 Ironically, this new mosaic required much less time to make, yet is visually more complex and engaging. I think this mosaic is a reflection of the confidence I have gained as an artist. After thousands of hours of struggle, I now find myself improvising paintings and mosaics off the cuff and getting results that please me, sometimes surprisingly so. Previously, I worked so incredibly hard and never seemed to capture the vision, at least not to my satisfaction. Now things seem to flow.